@LeeM Just wondering if these firmware updates play with the way the card outputs sound in any way? In terms of the overall audio signature? So far, there shouldn't be any difference. A few bugs have been fixed that may have affected audio quality/playback for some users, and EQ changes now have a slight delay to prevent conflicts with the audio stream, but I cannot recall any changes to the overall sound. Yes exactly what I mean. Thank you. Just tried the Card in another pc and the intel speedstep is working ok.. So I am lost as to why its not working on my build. Back to the drawing board I guess. On the flip side, that's also good to know for our team, since it means that maybe we can narrow it down to the specs of your other system for testing, and not worry about testing for a wider range of potential system component/software conflicts. Been spending the last couple of hours trying to solve this. so far. changed graphics card..no change..put in slower memory..no change. tried a different sata cable from the psu. no change. removed Aura software . no change. removed icue software.. no change. Put in my old Asus xonar card in the same slot the Evga card was in...Speedstep works fine. So I can only conclude something is wrong the the Evga card. Firmware related maybe cause not installing the software still speedstep doesn't work. Could it be an issue how the Usb is working with this motherboard? Possibly. I probably won't be able to get an answer or additional troubleshooting steps for you until early next week. My Nu Audio control panel does not work correctly, the EQ settings do nothing and neither does the sound colour digital filter. I have also had to restart as no videos would play on youtube/twitch via firefox nor chrome. Youtube kept telling me if playback does not resume to restart my device. It is the first time i have had that happen. A restart cleared it. 120gb OS ssd, 256gb game ssd, 2tb hdd. Thanks for responding. I did what was shown in your post and it did correct the problem with speedstep. Unfortunate having to disable something to get it working. The only thing I can tell between the Nu Audio card and the Xonar is I don't think the Xonar connects using a USB chip. Im not technically up on the connections. But I've read it uses a pci-e to pci bridge chip. I did not dig too deep as I don't own an Asus board, it might be a question of is it you use one or the other but not both? Another ASUS owner here with the same issue with Speed Shift. Whenever NU Audio is active for any reason, CPU multiplier is locked at max, even with overclocking disabled. That's not good for me, because I often enable monitoring of the line-in port to listen to an external audio source (via sound control panel "listen" feature, because NU doesn't have built-in monitoring). Even if I set monitoring playback to a different sound card, the CPU stays at max speed because the NU Audio is recording. Reading up on Speed Shift, the feature passes speed control over to the CPU for improved responsiveness, so I don't particularly want to disable it. Are there other motherboard brands (with confirmed Speed Shift support) that encounter this problem, or is it really specific to ASUS? Will NU Audio ever get support for monitoring at the DSP-level, so that I don't need to rely on the Windows "listen to" function? I am disappointed with the card and there is a point for which I have been about to return it. I need imperatively that my Nu Audio connected by Toslink to a Yamaha 5.1 amplifier, when I play a movie in DTS or Dolby Digital does not work in these formats. With any motherboard the integrated Realtek audio does the pass through and this works from minute 0 even if you do not install your drivers. It is incredible that with an EVGA card of this price we continue without solving the problem. We're still looking into this. We tested an ASUS Strix RAID DLX card (which also runs on the same PCIe to USB bridge), and it appeared to have the same behavior on the ASUS motherboard with Speed Shift enabled (i.e. max turbo speeds), so it seems like it might be something to do with how the USB driver and MB are working together. Yes, we are aware of that issue, and it's currently a priority for us to fix. As soon as I have an update on the projected fix date, I will post it here. Hi, is there any news on the speedstep issue? Or will I need to contact Asus? Not that I hold much luck with that. No update since I've previously posted about the issue. To recap, we think there may be some potential to adjust the driver to fix it, but this doesn't just occur with our audio card. It's probably more of a bus issue and power command issue. I know we have one driver coming up soon, which likely won't cover this issue, but I'll check into whether there's been any progress. I've just installed the audio card (moving from Asus Xonar STX) and I am a bit disappointed with the software (and by a bit I mean - a lot). There's no real option to switch between the speakers and headphones output. If the speakers or headphones mute button is pressed and then you change the volume up or down, the muted output is back on. This way if you're listening to your headphones and just change the volume the speakers are automatically back on. Please add an option to actually toggle between the speakers and the headphones output - I'm thinking of a drop down "Output" menu with "Speakers", "S/PDIF", "Headphones", "Front Panel Headphones" options where the selected output option REALLY TURNS OFF the rest of the outputs. 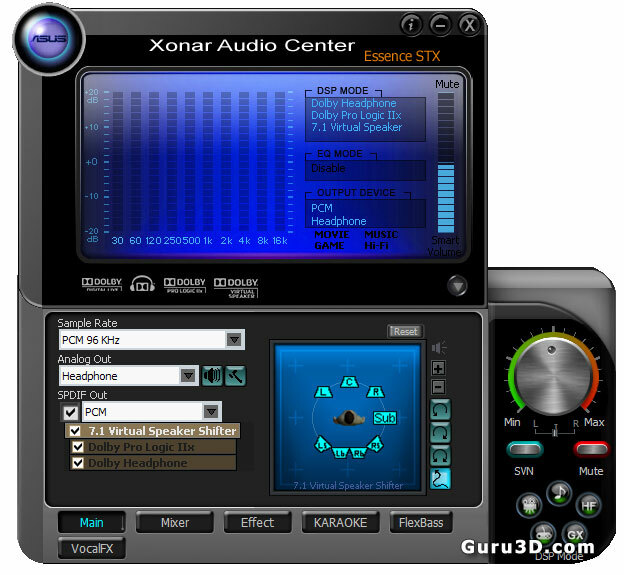 Just google images of asus xonar software and you'll see what I'm talking about. I can toggle between each with the Speaker in the Task Bar with ease. I do not see why I want to start the software up only to change the output. Noted. I'll pass this along. Between SPDIF and analog, sure. But you can't toggle between different analog sources. Update: Updated to the latest Asus bios 0903 for the maximus xi hero and it seems to have resolved the speedstep issue....Speedshift its still enabled and the frequencies are now changing how they are meant to. Hope it stays that way. Btw, we are expecting a new driver update very soon. It will add ASIO preferred buffer options, some UI changes, and some additional bug fixes (I don't have a list of the bug fixes at this point). EVGATech_LeeM Btw, we are expecting a new driver update very soon. It will add ASIO preferred buffer options, some UI changes, and some additional bug fixes (I don't have a list of the bug fixes at this point). Be nice if they could add the Stereo Mix function. Make the card more complete. This is a feature that we hope to have in a future update. It's doable. I believe you mentioned that surround support would be coming to the card maybe as early as April. My question is that software support for the 5.1 optical surround people have commented isn't supported atm or is that software for 7.1 support digitally for gaming like other sound cards and dacs? Two separate items. The support for DTS/Dolby passthrough will likely come in the next 2-3 weeks, if not sooner. Virtual Headphone Surround support (in-app, that is), will come roughly April time-frame, but might be a little earlier. Regarding the latter, you can still use Sonic, Dolby Atmos for Headphones, or if a game it offers its own virtual surround, such as BFV, in the meantime. More details on that later, however. So, is DTS/Dolby passthrough now supported? it's been 5 weeks since. I've been having an issue with my NU audio application suddenly quitting when I hit the arrow to go to the "equalizer" when I have the sample rate set at 32-bit/384khz. But if I set it to 32bit 192khz and lower it works perfectly fine but anything about 32 192khz to 384khz the app crashes with no error code. I have a dedicated sata power connected to the soundcard and nothing else, I have uninstalled the driver and deleted the folder in the install directory and restarted and reinstalled the software/driver package and it still has the same problem. Any other suggestions? I have windows 10 64bit btw. FYI, I removed the duplicate post above this one. I'm putting up a new driver before I leave for the day, and you can see if that helps with the issue you're describing. I'll check back during the weekend to see how it's going. Passthrough work is still ongoing. We're working on the integration part of putting it into the driver, but it is nearing completion. We are working with a third-party on this part of the process, so this has led to a little more delay than expected. I appreciate everyone's patience on this, but I expect this to be finished in less than 2 weeks. Well this new driver fixed my problem. Application no longer quits when trying to go to Equalizer when 32bit, 384khz is selected good job! now just waiting for DTS support.